Cook spiral pasta as per package directions, but cook only until al dente (pasta will finish cooking in casserole). Drain, rinse and set aside. Slice sausage links into ½-inch pieces. Heat a heavy skillet over medium-high heat. Add the olive oil. When oil begins to shimmer, add the sausage pieces, onion, mushrooms and garlic. Cook, stirring frequently, until sausage begins to brown. Remove from heat. 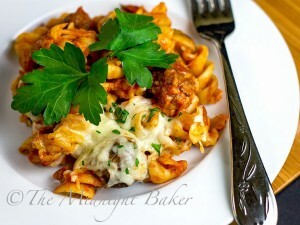 In a large bowl, combine the pasta, sausage mixture, the cheddar cheese, 1 cup of the mozzarella and the spaghetti sauce. Stir well to combine. Turn out into prepared baking dish. Cover with foil and bake at 350 degrees F for 25-30 minutes. Remove foil and top with the remaining mozzarella cheese. Return to oven and bake an additional 10-15 minutes, or until cheese is melted and beginning to bubble.